Not to be confused with N. S. Chandra Bose. "Netaji" redirects here. For the 2019 Irula-language film, see Netaji (2019 film). For the 2019 television series, see Netaji (2019 TV Series). Bose had been a leader of the younger, radical, wing of the Indian National Congress in the late 1920s and 1930s, rising to become Congress President in 1938 and 1939. [i] However, he was ousted from Congress leadership positions in 1939 following differences with Mahatma Gandhi and the Congress high command. He was subsequently placed under house arrest by the British before escaping from India in 1940. Bose arrived in Germany in April 1941, where the leadership offered unexpected, if sometimes ambivalent, sympathy for the cause of India's independence, contrasting starkly with its attitudes towards other colonised peoples and ethnic communities. In November 1941, with German funds, a Free India Centre was set up in Berlin, and soon a Free India Radio, on which Bose broadcast nightly. A 3,000-strong Free India Legion, comprising Indians captured by Erwin Rommel's Afrika Korps, was also formed to aid in a possible future German land invasion of India. By spring 1942, in light of Japanese victories in southeast Asia and changing German priorities, a German invasion of India became untenable, and Bose became keen to move to southeast Asia. Adolf Hitler, during his only meeting with Bose in late May 1942, suggested the same, and offered to arrange for a submarine. During this time Bose also became a father; his wife,  or companion,[j] Emilie Schenkl, whom he had met in 1934, gave birth to a baby girl in November 1942. Identifying strongly with the Axis powers, and no longer apologetically, Bose boarded a German submarine in February 1943. In Madagascar, he was transferred to a Japanese submarine from which he disembarked in Japanese-held Sumatra in May 1943. Subhas Bose, standing, extreme right, with his family of 14 siblings in Cuttack, ca. 1905. Subhas Chandra Bose was born on 23 January 1897 (at 12.10 pm) in Cuttack, Orissa Division, Bengal Province, to Prabhavati Dutt Bose and Janakinath Bose, an advocate belonging to a Kayastha[w] family. He was the ninth in a family of 14 children. His family was well to do. He was admitted to the Protestant European School (presently Stewart High School) in Cuttack, like his brothers and sisters, in January 1902. He continued his studies at this school which was run by the Baptist Mission up to 1909 and then shifted to the Ravenshaw Collegiate School. Here, he was ridiculed by his fellow students because he knew very little Bengali. The day Subhas was admitted to this school, Beni Madhab Das, the headmaster, understood how brilliant and scintillating his genius was. After securing the second position in the matriculation examination in 1913, he got admitted to the Presidency College where he studied briefly. He was influenced by the teachings of Swami Vivekananda and Ramakrishna after reading their works at the age of 16. He felt that his religion was more important than his studies. In those days, the British in Calcutta often made offensive remarks to the Indians in public places and insulted them openly. This behavior of the British as well as the outbreak of World War I began to influence his thinking. His nationalistic temperament came to light when he was expelled for assaulting Professor Oaten(who had manhandled some Indian students) for the latter's anti-India comments. He was expelled although he appealed that he only witnessed the assault and did not actually participate in it. He later joined the Scottish Church College at the University of Calcutta and passed his B.A. in 1918 in philosophy. Bose left India in 1919 for England with a promise to his father that he would appear in the Indian Civil Services (ICS) examination. He went to study in Fitzwilliam College, Cambridge and matriculated on 19 November 1919. He came fourth in the ICS examination and was selected, but he did not want to work under an alien government which would mean serving the British. As he stood on the verge of taking the plunge by resigning from the Indian Civil Service in 1921, he wrote to his elder brother Sarat Chandra Bose: "Only on the soil of sacrifice and suffering can we raise our national edifice." He resigned from his civil service job on 23 April 1921 and returned to India. Bose at the inauguration of the India Society in Prague in 1926. Subhas Bose, General Officer Commanding, Congress Volunteer Corps (in military uniform) with Congress president, Motilal Nehru, taking the salute. Annual meeting, Indian National Congress, December 29, 1928. He started the newspaper Swaraj and took charge of publicity for the Bengal Provincial Congress Committee. His mentor was Chittaranjan Das who was a spokesman for aggressive nationalism in Bengal. In the year 1923, Bose was elected the President of All India Youth Congress and also the Secretary of Bengal State Congress. He was also the editor of the newspaper "Forward", founded by Chittaranjan Das. Bose worked as the CEO of the Calcutta Municipal Corporation for Das when the latter was elected mayor of Calcutta in 1924. 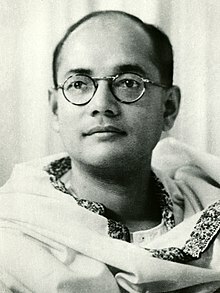 In a roundup of nationalists in 1925, Bose was arrested and sent to prison in Mandalay, where he contracted tuberculosis. Bose organized a volunteer corps in uniform, its officers were even provided with steel-cut epaulettes ... his uniform was made by a firm of British tailors in Calcutta, Harman's. A telegram addressed to him as GOC was delivered to the British General in Fort William and was the subject of a good deal of malicious gossip in the (British Indian) press. Mahatma Gandhi is a sincere pacifist vowed to non-violence, did not like the strutting, clicking of boots, and saluting, and he afterward described the Calcutta session of the Congress as a Bertram Mills circus, which caused a great deal of indignation among the Bengalis. A little later, Bose was again arrested and jailed for civil disobedience; this time he emerged to become Mayor of Calcutta in 1930. Bose with Emilie Schenkl, in Bad Gastein, Austria, 1936. Bose, INC president-elect, center, in Bad Gastein, Austria, December 1937, with (left to right) A. C. N. Nambiar (Bose's second-in-command, Berlin, 1941–1945), Heidi Fulop-Miller, Schenkl, and Amiya Bose. During the mid-1930s Bose travelled in Europe, visiting Indian students and European politicians, including Benito Mussolini. He observed party organisation and saw communism and fascism in action. In this period, he also researched and wrote the first part of his book The Indian Struggle, which covered the country's independence movement in the years 1920–1934. Although it was published in London in 1935, the British government banned the book in the colony out of fears that it would encourage unrest. Bose arriving at the 1939 annual session of the Congress, where he was re-elected, but later had to resign after disagreements with Gandhi and the Congress High Command. By 1938 Bose had become a leader of national stature and agreed to accept nomination as Congress President.He stood for unqualified Swaraj (self-governance), including the use of force against the British. This meant a confrontation with Mohandas Gandhi, who in fact opposed Bose's presidency, splitting the Indian National Congress party. Bose attempted to maintain unity, but Gandhi advised Bose to form his own cabinet. The rift also divided Bose and Nehru. Bose appeared at the 1939 Congress meeting on a stretcher. He was elected president again over Gandhi's preferred candidate Pattabhi Sitaramayya. U. Muthuramalingam Thevar strongly supported Bose in the intra-Congress dispute. Thevar mobilised all south India votes for Bose. However, due to the manoeuvrings of the Gandhi-led clique in the Congress Working Committee, Bose found himself forced to resign from the Congress presidency. On 22 June 1939 Bose organised the All India Forward Bloc a faction within the Indian National Congress, aimed at consolidating the political left, but its main strength was in his home state, Bengal. U Muthuramalingam Thevar, who was a staunch supporter of Bose from the beginning, joined the Forward Bloc. When Bose visited Madurai on 6 September, Thevar organised a massive rally as his reception. When Subash Chandra Bose was heading to Madurai, on an invitation of Muthuramalinga Thevar to amass support for the Forward Bloc, he passed through Madras and spent three days at Gandhi Peak. His correspondence reveals that despite his clear dislike for British subjugation, he was deeply impressed by their methodical and systematic approach and their steadfastly disciplinarian outlook towards life. In England, he exchanged ideas on the future of India with British Labour Party leaders and political thinkers like Lord Halifax, George Lansbury, Clement Attlee, Arthur Greenwood, Harold Laski, J.B.S. Haldane, Ivor Jennings, G.D.H. Cole, Gilbert Murray and Sir Stafford Cripps. He came to believe that an independent India needed socialist authoritarianism, on the lines of Turkey's Kemal Atatürk, for at least two decades. For political reasons Bose was refused permission by the British authorities to meet Atatürk at Ankara. During his sojourn in England Bose tried to schedule appointments with several politicians, but only the Labour Party and Liberal politicians agreed to meet with him. Conservative Party officials refused to meet him or show him courtesy because he was a politician coming from a colony. In the 1930s leading figures in the Conservative Party had opposed even Dominion status for India. It was during the Labour Party government of 1945–1951, with Attlee as the Prime Minister, that India gained independence. On the outbreak of war, Bose advocated a campaign of mass civil disobedience to protest against Viceroy Lord Linlithgow's decision to declare war on India's behalf without consulting the Congress leadership. Having failed to persuade Gandhi of the necessity of this, Bose organised mass protests in Calcutta calling for the 'Holwell Monument' commemorating the Black Hole of Calcutta, which then stood at the corner of Dalhousie Square, to be removed. He was thrown in jail by the British, but was released following a seven-day hunger strike. Bose's house in Calcutta was kept under surveillance by the CID. Bose greeting Heinrich Himmler (right), the Nazi Minister of Interior, head of the SS, and the Gestapo, 1942. Bose's arrest and subsequent release set the scene for his escape to Germany, via Afghanistan and the Soviet Union. A few days before his escape, he sought solitude and, on this pretext, avoided meeting British guards and grew a beard. Late night 16 January 1941, the night of his escape, he dressed as a Pathan (brown long coat, a black fez-type coat and broad pyjamas) to avoid being identified. Bose escaped from under British surveillance from his Elgin Road house in Calcutta about 01:25AM on 17 January 1941, accompanied by his nephew Sisir Kumar Bose in a German-made Wanderer W24 Sedan car, which would take him to Gomoh Railway Station in then state of Bihar, India. The car (Registration No. BLA 7169) was bought by Subhash Chandra Bose's elder brother Sarat Chandra Bose in 1937. The car is now on display at his Elgin Road home in Calcutta, India. He journeyed to Peshawar with the help of the Abwehr, where he was met by Akbar Shah, Mohammed Shah and Bhagat Ram Talwar. Bose was taken to the home of Abad Khan, a trusted friend of Akbar Shah's. On 26 January 1941, Bose began his journey to reach Russia through British India's North West frontier with Afghanistan. For this reason, he enlisted the help of Mian Akbar Shah, then a Forward Bloc leader in the North-West Frontier Province. Shah had been out of India en route to the Soviet Union, and suggested a novel disguise for Bose to assume. Since Bose could not speak one word of Pashto, it would make him an easy target of Pashto speakers working for the British. For this reason, Shah suggested that Bose act deaf and dumb, and let his beard grow to mimic those of the tribesmen. Bose's guide Bhagat Ram Talwar, unknown to him, was a Soviet agent. Supporters of the Aga Khan III helped him across the border into Afghanistan where he was met by an Abwehr unit posing as a party of road construction engineers from the Organization Todt who then aided his passage across Afghanistan via Kabul to the border with Soviet Russia. After assuming the guise of a Pashtun insurance agent ("Ziaudddin") to reach Afghanistan, Bose changed his guise and travelled to Moscow on the Italian passport of an Italian nobleman "Count Orlando Mazzotta". From Moscow, he reached Rome, and from there he travelled to Germany. Once in Russia the NKVD transported Bose to Moscow where he hoped that Russia's traditional enmity to British rule in India would result in support for his plans for a popular rising in India. However, Bose found the Soviets' response disappointing and was rapidly passed over to the German Ambassador in Moscow, Count von der Schulenburg. He had Bose flown on to Berlin in a special courier aircraft at the beginning of April where he was to receive a more favourable hearing from Joachim von Ribbentrop and the Foreign Ministry officials at the Wilhelmstrasse. In Germany, he was attached to the Special Bureau for India under Adam von Trott zu Solz which was responsible for broadcasting on the German-sponsored Azad Hind Radio. He founded the Free India Center in Berlin, and created the Indian Legion (consisting of some 4500 soldiers) out of Indian prisoners of war who had previously fought for the British in North Africa prior to their capture by Axis forces. The Indian Legion was attached to the Wehrmacht, and later transferred to the Waffen SS. Its members swore the following allegiance to Hitler and Bose: "I swear by God this holy oath that I will obey the leader of the German race and state, Adolf Hitler, as the commander of the German armed forces in the fight for India, whose leader is Subhas Chandra Bose". This oath clearly abrogates control of the Indian legion to the German armed forces whilst stating Bose's overall leadership of India. He was also, however, prepared to envisage an invasion of India via the USSR by Nazi troops, spearheaded by the Azad Hind Legion; many have questioned his judgment here, as it seems unlikely that the Germans could have been easily persuaded to leave after such an invasion, which might also have resulted in an Axis victory in the War. In all, 3,000 Indian prisoners of war signed up for the Free India Legion. But instead of being delighted, Bose was worried. A left-wing admirer of Russia, he was devastated when Hitler's tanks rolled across the Soviet border. Matters were worsened by the fact that the now-retreating German army would be in no position to offer him help in driving the British from India. When he met Hitler in May 1942, his suspicions were confirmed, and he came to believe that the Nazi leader was more interested in using his men to win propaganda victories than military ones. So, in February 1943, Bose turned his back on his legionnaires and slipped secretly away aboard a submarine bound for Japan. This left the men he had recruited leaderless and demoralised in Germany. Bose lived in Berlin from 1941 until 1943. During his earlier visit to Germany in 1934, he had met Emilie Schenkl, the daughter of an Austrian veterinarian whom he married in 1937. Their daughter is Anita Bose Pfaff. Bose's party, the Forward Bloc, has contested this fact. The crew of Japanese submarine I-29 after the rendezvous with German submarine U-180 300 sm southeast of Madagascar; Bose is sitting in the front row (28 April 1943). Bose speaking in Tokyo in 1943. In 1943, after being disillusioned that Germany could be of any help in gaining India's independence, he left for Japan. He travelled with the German submarine U-180 around the Cape of Good Hope to the southeast of Madagascar, where he was transferred to the I-29 for the rest of the journey to Imperial Japan. This was the only civilian transfer between two submarines of two different navies in World War II. The Indian National Army (INA) was the brainchild of Japanese Major (and post-war Lieutenant-General) Iwaichi Fujiwara, head the Japanese intelligence unit Fujiwara Kikan and had its origins, first in the meetings between Fujiwara and the president of the Bangkok chapter of the Indian Independence League, Pritam Singh Dhillon, and then, through Pritam Singh's network, in the recruitment by Fujiwara of a captured British Indian army captain, Mohan Singh on the western Malayan peninsula in December 1941; Fujiwara's mission was "to raise an army which would fight alongside the Japanese army." After the initial proposal by Fujiwara the Indian National Army was formed as a result of discussion between Fujiwara and Mohan Singh in the second half of December 1941, and the name chosen jointly by them in the first week of January 1942. This was along the concept of—and with support of—what was then known as the Indian Independence League, headed by expatriate nationalist leader Rash Behari Bose. The first INA was however disbanded in December 1942 after disagreements between the Hikari Kikan and Mohan Singh, who came to believe that the Japanese High Command was using the INA as a mere pawn and propaganda tool. Mohan Singh was taken into custody and the troops returned to the prisoner-of-war camp. However, the idea of an independence army was revived with the arrival of Subhas Chandra Bose in the Far East in 1943. In July, at a meeting in Singapore, Rash Behari Bose handed over control of the organisation to Subhas Chandra Bose. Bose was able to reorganise the fledgling army and organise massive support among the expatriate Indian population in south-east Asia, who lent their support by both enlisting in the Indian National Army, as well as financially in response to Bose's calls for sacrifice for the independence cause. INA had a separate women's unit, the Rani of Jhansi Regiment (named after Rani Lakshmi Bai) headed by Capt. Lakshmi Swaminathan, which is seen as a first of its kind in Asia. Even when faced with military reverses, Bose was able to maintain support for the Azad Hind movement. Spoken as a part of a motivational speech for the Indian National Army at a rally of Indians in Burma on 4 July 1944, Bose's most famous quote was "Give me blood, and I shall give you freedom!" In this, he urged the people of India to join him in his fight against the British Raj. Spoken in Hindi, Bose's words are highly evocative. 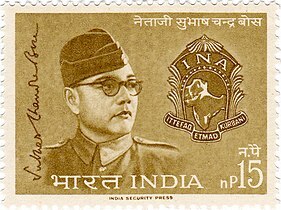 The troops of the INA were under the aegis of a provisional government, the Azad Hind Government, which came to produce its own currency, postage stamps, court and civil code, and was recognised by nine Axis states — Germany, Japan, Italian Social Republic, the Independent State of Croatia, Wang Jingwei regime in Nanjing, China, a provisional government of Burma, Manchukuo and Japanese-controlled Philippines. Recent researches[which?] have shown that the USSR too had diplomatic contact with the "Provisional Government of Free India". Of those countries, five were authorities established under Axis occupation. This government participated in the so-called Greater East Asia Conference as an observer in November 1943. The INA's first commitment was in the Japanese thrust towards Eastern Indian frontiers of Manipur. INA's special forces, the Bahadur Group, were extensively involved in operations behind enemy lines both during the diversionary attacks in Arakan, as well as the Japanese thrust towards Imphal and Kohima, along with the Burmese National Army led by Ba Maw and Aung San. The Japanese also took possession of Andaman and Nicobar Islands in 1942 and a year later, the Provisional Government and the INA were established in the Andaman and Nicobar Islands with Lt Col. A.D. Loganathan appointed its Governor General. The islands were renamed Shaheed (Martyr) and Swaraj (Independence). However, the Japanese Navy remained in essential control of the island's administration. During Bose's only visit to the islands in early 1944, apparently in the interest of shielding Bose from attaining a full knowledge of ultimate Japanese intentions, Bose's Japanese hosts carefully isolated him from the local population. At that time the island's Japanese administration had been torturing the leader of the island's Indian Independence League, Dr. Diwan Singh, who later died of his injuries in the Cellular Jail. During Bose's visit to the islands several locals attempted to alert Bose to Dr. Singh's plight, but apparently without success. During this time Lt. Col Loganathan became aware of his lack of any genuine administrative control and resigned in protest as Governor General, later returning to the Government's headquarters in Rangoon. On the Indian mainland, an Indian Tricolour, modelled after that of the Indian National Congress, was raised for the first time in the town of Moirang, in Manipur, in north-eastern India. The adjacent towns of Kohima and Imphal were then encircled and placed under siege by divisions of the Japanese Army, working in conjunction with the Burmese National Army, and with Brigades of the INA, known as the Gandhi and Nehru Brigades. This attempt at conquering the Indian mainland had the Axis codename of Operation U-Go. During this operation, On 6 July 1944, in a speech broadcast by the Azad Hind Radio from Singapore, Bose addressed Mahatma Gandhi as the "Father of the Nation" and asked for his blessings and good wishes for the war he was fighting. This was the first time that Gandhi was referred to by this appellation. The protracted Japanese attempts to take these two towns depleted Japanese resources, with Operation U-Go ultimately proving unsuccessful. Through several months of Japanese onslaught on these two towns, Commonwealth forces remained entrenched in the towns. Commonwealth forces then counter-attacked, inflicting serious losses on the Axis led forces, who were then forced into a retreat back into Burmese territory. After the Japanese defeat at the battles of Kohima and Imphal, Bose's Provisional Government's aim of establishing a base in mainland India was lost forever. Still the INA fought in key battles against the British Indian Army in Burmese territory, notable in Meiktilla, Mandalay, Pegu, Nyangyu and Mount Popa. However, with the fall of Rangoon, Bose's government ceased to be an effective political entity. A large proportion of the INA troops surrendered under Lt Col Loganathan. The remaining troops retreated with Bose towards Malaya or made for Thailand. Japan's surrender at the end of the war also led to the surrender of the remaining elements of the Indian National Army. The INA prisoners were then repatriated to India and some tried for treason. The last aeroplane journeys of Subhas Chandra Bose. A memorial to Subhas Chandra Bose in the Renkōji Temple, Tokyo. Bose's ashes are stored in the temple in a golden pagoda. In the consensus of scholarly opinion, Subhas Chandra Bose's death occurred from third-degree burns on 18 August 1945 after his overloaded Japanese plane crashed in Japanese-ruled Formosa (now Taiwan). However, many among his supporters, especially in Bengal, refused at the time, and have refused since, to believe either the fact or the circumstances of his death. Conspiracy theories appeared within hours of his death and have thereafter had a long shelf life,[z] keeping alive various martial myths about Bose. A disinfectant, Rivamol, was put over most of his body and then a white ointment was applied and he was bandaged over most of his body. Dr. Yoshimi gave Bose four injections of Vita Camphor and two of Digitamine for his weakened heart. These were given about every 30 minutes. Since his body had lost fluids quickly upon being burnt, he was also given Ringer solution intravenously. A third doctor, Dr. Ishii gave him a blood transfusion. An orderly, Kazuo Mitsui, an army private, was in the room and several nurses were also assisting. Bose still had a clear head which Dr. Yoshimi found remarkable for someone with such severe injuries. Soon, in spite of the treatment, Bose went into a coma. A few hours later, between 9 and 10 PM (local time) on Saturday 18 August 1945, Bose died aged 48. Bose's body was cremated in the main Taihoku crematorium two days later, 20 August 1945. On 23 August 1945, the Japanese news agency Do Trzei announced the death of Bose and Shidea. On 7 September a Japanese officer, Lieutenant Tatsuo Hayashida, carried Bose's ashes to Tokyo, and the following morning they were handed to the president of the Tokyo Indian Independence League, Rama Murti. On 14 September a memorial service was held for Bose in Tokyo and a few days later the ashes were turned over to the priest of the Renkōji Temple of Nichiren Buddhism in Tokyo. There they have remained ever since. Among the INA personnel, there was widespread disbelief, shock, and trauma. Most affected were the young Tamil Indians from Malaya and Singapore, both men and women, who comprised the bulk of the civilians who had enlisted in the INA. The professional soldiers in the INA, most of whom were Punjabis, faced an uncertain future, with many fatalistically expecting reprisals from the British. In India the Indian National Congress's official line was succinctly expressed in a letter Mohandas Karamchand Gandhi wrote to Rajkumari Amrit Kaur. Said Gandhi, "Subhas Bose has died well. He was undoubtedly a patriot, though misguided." Many congressmen had not forgiven Bose for quarrelling with Gandhi and for collaborating with what they considered was Japanese fascism. The Indian soldiers in the British Indian army, some two and a half million of whom had fought during the Second World War, were conflicted about the INA. Some saw the INA as traitors and wanted them punished; others felt more sympathetic. The British Raj, though never seriously threatened by the INA, tried 300 INA officers for treason in the INA trials, but eventually backtracked. Bose was featured on the stamps in India from 1964, 1993, 1997, 2001, 2016 and 2018. Netaji Subhas Chandra Bose International Airport at Kolkata, Netaji Subhash Chandra Bose Island, formerly Ross Island and many other institutions in India are named after him. On 23 August 2007, Japanese Prime Minister, Shinzō Abe visited the Subhas Chandra Bose memorial hall in Kolkata. Abe said to Bose's family "The Japanese are deeply moved by Bose's strong will to have led the Indian independence movement from British rule. Netaji is a much respected name in Japan. The following words are inscribed on a brass shield in front of the chair. "Netaji Subhash Chandra Bose in order to free India from the shackles of British imperialism organized the Azad Hind Government from outside the country on October 21, 1943. Netaji set up the Provisional Government of Independent India (Azad Hind) and transferred its headquarter at Rangoon on January 7, 1944. On the 5th April, 1944, the "Azad Hind Bank" was inaugurated at Rangoon. It was on this occasion that Netaji used this chair for the first time. Later the chair was kept at the residence of Netaji at 51, University Avenue, Rangoon, where the office of the Azad Hind Government was also housed. Afterwards, at the time of leaving Burma, the Britishers handed over the chair to the family of Mr. A.T. Ahuja, the well known business man of Rangoon. The chair was officially handed over to the Government of India in January 1979. It was brought to Calcutta on the 17th July, 1980. It has now been ceremonially installed at the Red Fort on July 7, 1981." Bose advocated complete unconditional independence for India, whereas the All-India Congress Committee wanted it in phases, through Dominion status. Finally at the historic Lahore Congress convention, the Congress adopted Purna Swaraj (complete independence) as its motto. Gandhi was given rousing receptions wherever he went after Gandhi-Irwin pact. Subhas Chandra Bose, travelling with Gandhi in these endeavours, later wrote that the great enthusiasm he saw among the people enthused him tremendously and that he doubted if any other leader anywhere in the world received such a reception as Gandhi did during these travels across the country. He was imprisoned and expelled from India. Defying the ban, he came back to India and was imprisoned again. Bose was elected president of the Indian National Congress for two consecutive terms, but had to resign from the post following ideological conflicts with Mohandas K. Gandhi and after openly attacking the Congress' foreign and internal policies. Bose believed that Gandhi's tactics of non-violence would never be sufficient to secure India's independence, and advocated violent resistance. He established a separate political party, the All India Forward Bloc and continued to call for the full and immediate independence of India from British rule. He was imprisoned by the British authorities eleven times. His stance did not change with the outbreak of the Second World War, which he saw as an opportunity to take advantage of British weakness. At the outset of the war, he left India, travelling to the Soviet Union, Nazi Germany and Imperial Japan, seeking an alliance with each of them to attack the British government in India. With Imperial Japanese assistance, he re-organised and later led the Azad Hind Fauj or Indian National Army (INA), formed with Indian prisoners-of-war and plantation workers from British Malaya, Singapore, and other parts of Southeast Asia, against British forces. With Japanese monetary, political, diplomatic and military assistance, he formed the Azad Hind Government in exile, and regrouped and led the Indian National Army in failed military campaigns against the allies at Imphal and in Burma. Subhas Chandra Bose believed that the Bhagavad Gita was a great source of inspiration for the struggle against the British. Swami Vivekananda's teachings on universalism, his nationalist thoughts and his emphasis on social service and reform had all inspired Subhas Chandra Bose from his very young days. The fresh interpretation of the India's ancient scriptures had appealed immensely to him. Many scholars believe that Hindu spirituality formed the essential part of his political and social thought throughout his adult life, although there was no sense of bigotry or orthodoxy in it. Subhas who called himself a socialist, believed that socialism in India owed its origins to Swami Vivekananda. As historian Leonard Gordon explains "Inner religious explorations continued to be a part of his adult life. This set him apart from the slowly growing number of atheistic socialists and communists who dotted the Indian landscape.". Bose first expressed his preference for "a synthesis of what modern Europe calls socialism and fascism" in a 1930 speech in Calcutta. Bose later criticized Nehru's 1933 statement that there is "no middle road" between communism and fascism, describing it as "fundamentally wrong." Bose believed communism would not gain ground in India due to its rejection of nationalism and religion and suggested a "synthesis between communism and fascism" could take hold instead. In 1944, Bose similarly stated, "Our philosophy should be a synthesis between National Socialism and communism." Bose's correspondence (prior to 1939) reflects his deep disapproval of the racist practices of, and annulment of democratic institutions in Nazi Germany: "Today I regret that I have to return to India with the conviction that the new nationalism of Germany is not only narrow and selfish but arrogant." However, he expressed admiration for the authoritarian methods (though not the racial ideologies) which he saw in Italy and Germany during the 1930s, and thought they could be used in building an independent India. Bose had clearly expressed his belief that democracy was the best option for India. The pro-Bose thinkers believe that his authoritarian control of the Azad Hind was based on political pragmatism and a post-colonial doctrine rather than any anti-democratic belief. However, during the war (and possibly as early as the 1930s), Bose seems to have decided that no democratic system could be adequate to overcome India's poverty and social inequalities, and he wrote that a socialist state similar to that of Soviet Russia (which he had also seen and admired) would be needed for the process of national re-building. [aa] Accordingly, some suggest that Bose's alliance with the Axis during the war was based on more than just pragmatism, and that Bose was a militant nationalist, though not a Nazi nor a Fascist, for he supported empowerment of women, secularism and other liberal ideas; alternatively, others consider he might have been using populist methods of mobilisation common to many post-colonial leaders. His most famous quote was "Give me blood and I will give you freedom". Another famous quote was Dilli Chalo ("On to Delhi)!" This was the call he used to give the INA armies to motivate them. Jai Hind, or, "Glory to India!" was another slogan used by him and later adopted by the Government of India and the Indian Armed Forces. Another slogan coined by him was "Ittehad, Etemad, Qurbani" (Urdu for "Unity, Agreement, Sacrifice"). INA also used the slogan Inquilab Zindabad, which was coined by Maulana Hasrat Mohani. In 2004, Shyam Benegal directed the biographical film, Netaji Subhas Chandra Bose: The Forgotten Hero depicting his life in Nazi Germany (1941–1943), in Japanese-occupied Asia (1943–1945) and the events leading to the formation of Azad Hind Fauj. The film received critical acclaim at the BFI London Film Festival, and has garnered the National Film Award for Best Feature Film on National Integration, and the National Film Award for Best Production Design for that year. In 2017, ALTBalaji and BIG Synergy Media, released a 9-episode web series, Bose: Dead/Alive, which is a dramatised version of the book India's Biggest Cover-up written by Anuj Dhar, which starred Bollywood actor Rajkummar Rao as Subhas Chandra Bose and Anna Ador as Emilie Schenkl. The series was praised by both audience and critics, for its plot, performance and production design. ^ "If all else failed (Bose) wanted to become a prisoner of the Soviets: 'They are the only ones who will resist the British. My fate is with them. But as the Japanese plane took off from Taipei airport its engines faltered and then failed. Bose was badly burned in the crash. According to several witnesses, he died on 18 August in a Japanese military hospital, talking to the very last of India's freedom. British and Indian commissions later established convincingly that Bose had died in Taiwan. These were legendary and apocalyptic times, however. Having witnessed the first Indian leader to fight against the British since the great mutiny of 1857, many in both Southeast Asia and India refused to accept the loss of their hero. Rumours that Bose had survived and was waiting to come out of hiding and begin the final struggle for independence were rampant by the end of 1945. ^ "His romantic saga, coupled with his defiant nationalism, has made Bose a near-mythic figure, not only in his native Bengal, but across India." ^ "Bose's heroic endeavor still fires the imagination of many of his countrymen. But like a meteor which enters the earth's atmosphere, he burned brightly on the horizon for a brief moment only." ^ "Subhas Bose might have been a renegade leader who had challenged the authority of the Congress leadership and their principles. But in death he was a martyred patriot whose memory could be an ideal tool for political mobilization." ^ "The most troubling aspect of Bose's presence in Nazi Germany is not military or political but rather ethical. His alliance with the most genocidal regime in history poses serious dilemmas precisely because of his popularity and his having made a lifelong career of fighting the 'good cause'. How did a man who started his political career at the feet of Gandhi end up with Hitler, Mussolini, and Tojo? Even in the case of Mussolini and Tojo, the gravity of the dilemma pales in comparison to that posed by his association with Hitler and the Nazi leadership. The most disturbing issue, all too often ignored, is that in the many articles, minutes, memorandums, telegrams, letters, plans, and broadcasts Bose left behind in Germany, he did not express the slightest concern or sympathy for the millions who died in the concentration camps. Not one of his Berlin wartime associates or colleagues ever quotes him expressing any indignation. Not even when the horrors of Auschwitz and its satellite camps were exposed to the world upon being liberated by Soviet troops in early 1945, revealing publicly for the first time the genocidal nature of the Nazi regime, did Bose react." ^ "To many (Congress leaders), Bose's programme resembled that of the Japanese fascists, who were in the process of losing their gamble to achieve Asian ascendancy through war. Nevertheless, the success of his soldiers in Burma had stirred as much patriotic sentiment among Indians as the sacrifices of imprisoned Congress leaders. ^ "Marginalized within Congress and a target for British surveillance, Bose chose to embrace the fascist powers as allies against the British and fled India, first to Hitler's Germany, then, on a German submarine, to a Japanese-occupied Singapore. The force that he put together ... known as the Indian National Army (INA) and thus claiming to represent free India, saw action against the British in Burma but accomplished little toward the goal of a march on Delhi. ... Bose himself died in an aeroplane crash trying to reach Japanese-occupied territory in the last months of the war. ... It is this heroic, martial myth that is today remembered, rather than Bose's wartime vision of a free India under the authoritarian rule of someone like himself." ^ "Another small, but immediate, issue for the civilians in Berlin and the soldiers in training was how to address Subhas Bose. Vyas has given his view of how the term was adopted: 'one of our [soldier] boys came forward with "Hamare Neta". We improved upon it: "Netaji"... It must be mentioned, that Subhas Bose strongly disapproved of it. He began to yield only when he saw our military group ... firmly went on calling him "Netaji"' (Alexander) Werth also mentioned adoption of 'Netaji' and observed accurately, that it '... combined a sense both of affection and honour ...' It was not meant to echo 'Fuehrer' or 'Duce', but to give Subhas Bose a special Indian form of reverence and this term has been universally adopted by Indians everywhere in speaking about him." ^ "Jawaharlal Nehru and Subhas Bose were among those who, impatient with Gandhi's programmes and methods, looked upon socialism as an alternative for nationalistic policies capable of meeting the country's economic and social needs, as well as a link to potential international support." ^ "Although we must take Emilie Schenkl at her word (about her secret marriage to Bose in 1937), there are a few nagging doubts about an actual marriage ceremony because there is no document that I have seen and no testimony by any other person. ... Other biographers have written that Bose and Miss Schenkl were married in 1942, while Krishna Bose, implying 1941, leaves the date ambiguous. The strangest and most confusing testimony comes from A. C. N. Nambiar, who was with the couple in Badgastein briefly in 1937, and was with them in Berlin during the war as second-in-command to Bose. In an answer to my question about the marriage, he wrote to me in 1978: 'I cannot state anything definite about the marriage of Bose referred to by you, since I came to know of it only a good while after the end of the last world war ... I can imagine the marriage having been a very informal one ...'... So what are we left with? ... We know they had a close passionate relationship and that they had a child, Anita, born November 29, 1942, in Vienna. ... And we have Emilie Schenkl's testimony that they were married secretly in 1937. Whatever the precise dates, the most important thing is the relationship." ^ "Tojo turned over all his Indian POWs to Bose's command, and in October 1943 Bose announced the creation of a Provisional Government of Azad ("Free") India, of which he became head of state, prime minister, minister of war, and minister of foreign affairs. Some two million Indians were living in Southeast Asia when the Japanese seized control of that region, and these emigrees were the first "citizens" of that government, founded under the "protection" of Japan and headquartered on the "liberated" Andaman Islands. Bose declared war on the United States and Great Britain the day after his government was established. In January 1944 he moved his provisional capital to Rangoon and started his Indian National Army on their march north to the battle cry of the Meerut mutineers: "Chalo Delhi!" ^ "At the same time that the Japanese appreciated the firmness with which Bose's forces continued to fight, they were endlessly exasperated with him. A number of Japanese officers, even those like Fujiwara, who were devoted to the Indian cause, saw Bose as a military incompetent as well as an unrealistic and stubborn man who saw only his own needs and problems and could not see the larger picture of the war as the Japanese had to." ^ "Gracey consoled himself that Bose's Indian National Army had also been in action against his Indians and Gurkhas but had been roughly treated and almost annihilated; when the survivors tried to surrender, they tended to fall foul of the Gurkhas' dreaded kukri." ^ "The good news Wavell reported was that the RAF had just recently flown enough of its planes into Manipur's capital of Imphal to smash Netaji ("Leader") Subhas Chandra Bose's Indian National Army (INA) that had advanced to its outskirts before the monsoon began. Bose's INA consisted of about 20,000 of the British Indian soldiers captured by the Japanese in Singapore, who had volunteered to serve under Netaji Bose when he offered them "Freedom" if they were willing to risk their "Blood" to gain Indian independence a year earlier. The British considered Bose and his "army of traitors" no better than their Japanese sponsors, but to most of Bengal's 50 million Indians, Bose was a great national hero and potential "Liberator." The INA was stopped before entering Bengal, first by monsoon rains and then by the RAF, and forced to retreat, back through Burma and down its coast to the Malay peninsula. In May 1945, Bose would fly out of Saigon on an overloaded Japanese plane, headed for Taiwan, which crash-landed and burned. Bose suffered third-degree burns and died in the hospital on Formosa." ^ "The retreat was even more devastating, finally ending the dream of gaining Indian independence through military campaign. But Bose still remained optimistic, thought of regrouping after the Japanese surrender, contemplated seeking help from Soviet Russia. The Japanese agreed to provide him transport up to Manchuria from where he could travel to Russia. But on his way, on 18 August 1945 at Taihoku airport in Taiwan, he died in an air crash, which many Indians still believe never happened." ^ "There are still some in India today who believe that Bose remained alive and in Soviet custody, a once and future king of Indian independence. The legend of 'Netaii' Bose's survival helped bind together the defeated INA. In Bengal it became an assurance of the province's supreme importance in the liberation of the motherland. It sustained the morale of many across India and Southeast Asia who deplored the return of British power or felt alienated from the political settlement finally achieved by Gandhi and Nehru. ^ "On 21 March 1944, Subhas Bose and advanced units of the INA crossed the borders of India, entering Manipur, and by May they had advanced to the outskirts of that state's capital, Imphal. That was the closest Bose came to Bengal, where millions of his devoted followers awaited his army's "liberation." The British garrison at Imphal and its air arm withstood Bose's much larger force long enough for the monsoon rains to defer all possibility of warfare in that jungle region for the three months the British so desperately needed to strengthen their eastern wing. Bose had promised his men freedom in exchange for their blood, but the tide of battle turned against them after the 1944 rains, and in May 1945 the INA surrendered in Rangoon. Bose escaped on the last Japanese plane to leave Saigon, but he died in Formosa after a crash landing there in August. By that time, however, his death had been falsely reported so many times that a myth soon emerged in Bengal that Netaji Subhas Chandra was alive—raising another army in China or Tibet or the Soviet Union—and would return with it to "liberate" India. ^ "Subhas Bose was dead, killed in 1945 in a plane crash in the Far East, even though many of his devotees waited—as Barbarossa's disciples had done in another time and in another country—for their hero's second coming." ^ "The thrust of Sarkar's thought, like that of Chittaranjan Das and Subhas Bose, was to challenge the idea that 'the average Indian is indifferent to life', as R. K. Kumaria put it. India once possessed an energised, Machiavellian political culture. All it needed was a hero (rather than a Gandhi-style saint) to revive the culture and steer India to life and freedom through violent contentions of world forces (vishwa shakti) represented in imperialism, fascism and socialism." ^ "The (Japanese) Fifteenth Army, commanded by ... Maj.-General Mutuguchi Renya consisted of three experienced infantry divisions — 15th, 31st and 33rd — totalling 100,000 combat troops, with the 7,000 strong 1st Indian National Army (INA) Division in support. It was hoped the latter would subvert the Indian Army's loyalty and precipitate a popular rising in British India, but in reality the campaign revealed that it was largely a paper tiger." ^ "The real fault, however, must attach to the Japanese commander-in-chief Kawabe. Dithering, ... prostrated with amoebic dysentery, he periodically reasoned that he must cancel Operation U-Go in its entirety, but every time he summoned the courage to do so, a cable would arrive from Tokyo stressing the paramount necessity of victory in Burma, to compensate for the disasters in the Pacific. ... Even more incredibly, he still hoped for great things from Bose and the INA, despite all the evidence that both were busted flushes." 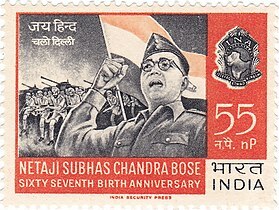 ^ "The claim is even made that without the Japanese-influenced 'Indian National Army' under Subhas Chandra Bose, India would not have achieved independence in 1947; though those who make claim seem unaware of the mood of the British people in 1945 and of the attitude of the newly-elected Labour government to the Indian question." ^ "Janakinath was a lawyer of a Kayastha family and was wealthy enough to educate his children well.He recalls being laughed at by his fellow studentsbecause he knew so little Bengali. At the age of fifteen, he first read the works of Swami Vivekananda and found a goal for his life-spiritual salvation foroneself and service to humanity. ^ "On November 4, 1937, Subhas sent a letter to Emilie in German, saying that he would probably travel to Europe in the middle of November. "Please write to Kurhaus Hochland, Badgastein," he instructed her, "and enquire if I (and you also) can stay there" He asked her to mention this message only to her parents, not to reply, and wait for his next airmail letter or telegram. On November 16, he sent a cable: "Starting aeroplane arriving Badgastein twenty second arrange lodging and meet me. ... He spent a month and a half—from November 22, 1937, to January 8, 1938—with Emilie at his favourite resort of Badgastein." ^ "On December 26, 1937, Subhas Chandra Bose secretly married Emilie Schenkl. Despite the obvious anguish, they chose to keep their relationship and marriage a closely guarded secret." ^ "Rumours that Bose had survived and was waiting to come out of hiding and begin the final struggle for independence were rampant by the end of 1945." ^ "The Fundamental Problems of India" (An address to the Faculty and students of Tokyo University, November 1944): "You cannot have a so-called democratic system, if that system has to put through economic reforms on a socialistic basis. Therefore we must have a political system – a State – of an authoritarian character. We have had some experience of democratic institutions in India and we have also studied the working of democratic institutions in countries like France, England and United States of America. And we have come to the conclusion that with a democratic system we cannot solve the problems of Free India. Therefore, modern progressive thought in India is in favour of a State of an authoritarian character"
^ a b c d e f Bayly & Harper 2007, p. 2. ^ a b c d e f Metcalf & Metcalf 2012, p. 210. ^ a b Kulke & Rothermund 2004, p. 311. ^ a b c d e Bandyopādhyāẏa 2004, p. 427. ^ a b Hayes 2011, p. 165. ^ a b Stein 2010, pp. 345. ^ a b Gordon 1990, pp. 459–460. ^ a b Stein 2010, pp. 305,325. ^ Low 2002, p. 297. ^ Low 2002, p. 313. ^ a b Hayes 2011, pp. 65–67. ^ Hayes 2011, p. 152. ^ Hayes 2011, p. 76. ^ Hayes 2011, pp. 87–88. ^ Hayes 2011, pp. 114–116. ^ a b Hayes 2011, p. 15. ^ a b Gordon 1990, pp. 344–345. ^ a b Hayes 2011, pp. 141–143. ^ Bose 2005, p. 255. ^ a b Low 1993, pp. 31–31. ^ a b Wolpert 2000, p. 339. ^ a b Gordon 1990, p. 517. ^ a b McLynn 2011, pp. 295–296. ^ a b Wolpert 2009, p. 69. ^ a b c Bayly & Harper 2007, p. 22. ^ a b c Wolpert 2000, pp. 339–340. ^ a b Chatterji 2007, p. 278. ^ a b Bayly 2012, p. 283. ^ a b c d e f g Bayly & Harper 2007, p. 21. ^ a b Moreman 2013, pp. 124–125. ^ a b McLynn 2011, p. 429. ^ a b Allen 2012, p. 179. ^ a b c d e f g Lebra 2008a, pp. 102—103. ^ Getz 2002, p. 7. ^ Jesudasen 2006, p. 57. ^ Mercado 2002, p. 73. ^ Vas 2008, p. 27. ^ Chakraborty & Bhaṭṭācārya 1989. ^ Vas 2008, p. 32. ^ a b Vipul 2009, p. 116. ^ a b c Gordon 1990, p. 190. ^ Bose & Bose 1997. ^ Bose 2011, p. 127. ^ Bose 2011, pp. 129–130. ^ Phadnis 2009, p. 185. ^ Padhy 2011, p. 234. ^ a b c Sen 1999. ^ Durga Das Pvt. Ltd 1985. ^ a b c d e Talwar 1976. ^ a b c d e Markandeya 1990. ^ James 1997, p. 554. ^ a b c Thomson 2004. ^ Majumdar 1997, pp. 10–14. ^ Hauner 1981, pp. 28–29. ^ Fay 1995, pp. 74–75. ^ Lebra 2008a, pp. 21–23. ^ Lebra 2008a, pp. 24–25. ^ Bayly & Harper 2007, p. 325. ^ a b c Gordon 1990, p. 540. ^ Fay 1995, p. 384. ^ a b c d e f g h i j Lebra 2008a, pp. 196–197. ^ Lebra 2008a, pp. 195–196. ^ a b c d e f Gordon 1990, p. 541. ^ a b c Gordon 1990, pp. 541–542. ^ a b c Gordon 1990, p. 542. ^ Gordon 1990, p. 543. ^ Gordon 1990, p. 544–545. ^ Lebra 2008a, pp. 197–198. ^ a b Gordon 1990, p. 545. ^ a b Roche 2007. ^ a b The Hindu 2007. ^ Narangoa & Cribb 2003. ^ Bose et al. 1996. ^ Pasricha 2008, pp. 64–65. ^ Bose 2011, p. 98. ^ Roy 2004, pp. 7–8. ^ a b Bose & Bose 1997a, pp. 319–20. ^ Roy 1996, pp. 51ff. Durga Das Pvt. Ltd (1985), Eminent Indians who was who, 1900–1980, also annual diary of events, Durga Das Pvt. Ltd.